Quick overview The book offers a pioneering account of a wide range of cultural forms in Soviet and post-Soviet Russia. It also offers a distinctive emphasis on the complex processes underlying the reception of culture. 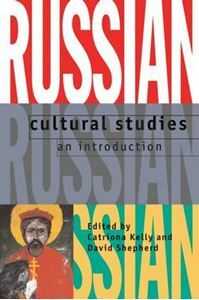 A vital resource for university courses on Russian culture, it will be essential reading for all with an interest in the subject. Intended as a companion to Constructing Russian Culture in the Age of Revolution: 1881-1940 (also published by OUP) and covering a later period until the present day, this stimulating, original, and controversial book will not only be a vital resource for university courses on Russian culture at undergraduate and postgraduate level but essential reading for all those interested in Russian culture in the Soviet and post-Soviet periods. In a wide-ranging account of a variety of cultural forms and sites of cultural production-literature, cinema, radio, television, the visual arts, journalism, advertising and consumerism, music, theatre, the Church-the book sets out to give greater prominence to the processes of cultural reception than in previous texts. The book highlights the role images of national identity, gender politics , youth culture and the interaction of public and private consciousness have played in the formation of cultural forms in the USSR and post-communist Russia. Drawing extensively but critically on the theoretical agenda of contemporary cultural studies the book challenges the 'top-down' model according to which cultural production is determined principally by its relationship to 'high' politics and political institutions. Contributors include leading specialists in Russian literature, cultural history, and cultural theory from Britain, the USA, and Russia and the text is liberally illustrated with picture features and includes a chronology of events and suggestions for further reading with each section.